This wideband no-tune FM broadcast band amplifier unit was developed to supplement the PCI MAX line of fm transmitters, but will work great with any LPFM (low power fm transmitter) on the market. 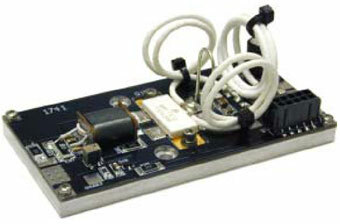 It takes the signal and amplifies it to the full power of 5W / 15W. It can also be used to power other smaller transmitters, up to about 1W of their output power (with engaged attenuator). It does not require tuning as it a wideband no-tune design. It also features a built-in SWR foldback protection that shuts the power off as soon as the SWR reaches critical levels. Unit works from a stabilised DC power supply (12-15V at 4A). IMPORTANT NOTE: If you use a 12V fan for cooling, these units typically push 15 - 20W of power. Here is the manual for the new 5W/15W booster. RF Output Power: Adjustable from 0 to max via potentiometer. RF output power can be hard-limited internally to 1W max for 5W model only. Spurious/Harmonic rejection: Harmonics: > 50dB min. 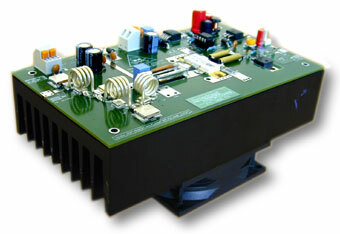 An ultra compact FM amplifier employing the latest RF techniques for an ultra-stable high effeciency design. 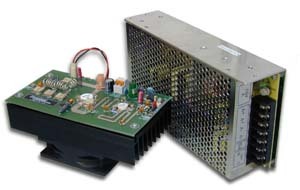 This unit can be supplied with a universal input switched mode power supply. This can be used on any mains voltage system in the world. A built in heatsink and fan assembly provides more than adequate cooling to the unit ensuring 24 hour operation. On board harmonic filtering provides that needed reassurance that your signal is where it should be. The 4 Watt input version works perfectly with our MAX PRO I transmitters (exciter needs to be run at 12V DC to reduce power to 4W). Supplied with a cooling fan for worry free 24 hour operation. It is NOT possible to use this unit with PCI MAX 2004! It may take a few days for us to ship the unit, depending on the stock! This 350W pallet amplifer is an integrated building block which only requires power and input and output rf connections. This highly effective amplifier has been designed for FM radio transmitter integrators and gives a great deal of flexibilty. This module has been in production for over 9 years with hundreds of sastified customers. This module is for system intergrators who will attach the pallet to their own cooling system. Perfect for MAX PRO 3, not recommended for PCI MAX! Power Gain 17dB Min, 18dB typ. Power Input 8 watt typ. Insertion phase variation +/- 5 deg. Baseplate temp 0 - +60 deg. This 750W pallet amplifer is an intergrated building block which only requires power and input and output rf connections. A low loss wilkinson input splitter and output combiner puts together two push-pull transistor pairs, guaranteeing good overall circuit performance at an attractive price. This module is for system integrators who will attach the pallet to their own cooling system (heatsink and fan) and incorporate their own low pass filter. 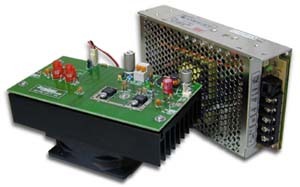 Customers who require built in low pass filter and 1 watt input drive capabilty should look at the 300w amp modules we sell, which also has a heatsink and fan assembly attached. Power Gain 16dB Min, 18dB typ. Power Input 15 watt typ. 18 watts max. Ideal for MAX PRO 3, not intended for PCI MAX! 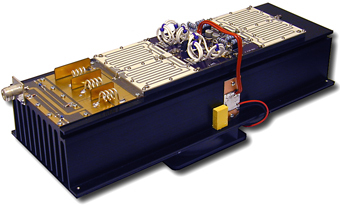 An ultra compact FM amplifier employing the latest RF techniques for an ultra-stable high effeciency design. 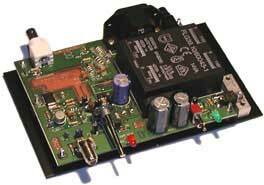 This unit can be supplied with a switched mode power supply. This can be used on 220-240V mains voltage system. A built in heatsink and fan assembly provides more than adequate cooling to the unit ensuring 24 hour operation. On board harmonic filtering provides that needed reassurance that your signal is where it should be. The 12 Watt input works perfectly with our MAX PRO III transmitters. Supplied with a cooling fan for worry free 24 hour operation. SWR measurement circuitry makes it easy to implement SWR protection. Available in APRIL 2005 !